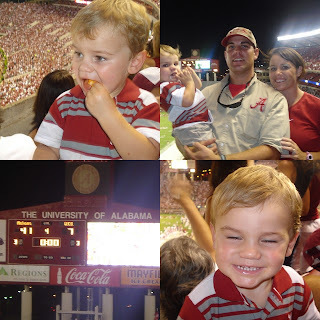 this past saturday, we drove up and went to the bama game w/ grandaddy. we had a great time and brady cole was a good boy during the game too. he lasted in the stands at our seats for the whole game, which is pretty good for a 2 yr old. he loved yelling "roll tide" as loud as he could. he even woke up sunday morning saying, "mama, i want watch football play."